So I'll just show you what I have done so far! Hope you like it! Donc je vous montre juste certains! J'espere que vous allez aimer! I was tagged by the lovely Oluwaseun from MyStyledExpressions and Ines from Dear Ines to do the 11 Questions Tag! You must post 11 things about yourself. Answer the questions that your tagger posted for you. Create 11 questions, then choose 11 people and tag them to answer your questions. Remember to let them know you tagged them. Let the tagger know when you answered their questions. I'm really sorry I feel kinda lazy at the moment to create the questions and tag other people but I'll try to find some time to do it. For those who are curious I've done this tag a couple of time already so you can still look under the "tag" label if you are curious! I'm sorry, some of the facts may be repetitive. 9. I'm an Asian food lover! 11. I've traveled a lot, but I still want to visit so many other places! Do you have any siblings? If yes, how many? Our greatest strength lies not in never failing, but in rising each time we fall. I like to read. / Go out with my friends ! I used to hate washing the dishes, now it's not that I hate it, but I'll say I got used to it. I'm not a morning person, so every other time of the day other than the morning | I like Friday, because it means weekend! :D | I love December because of the Christmas time! It's beautiful! 2 Dons ou pouvoirs que tu aimerais avoir? Lire les pensees des gens (meme si ca peut etre assez dangereux) et pouvoir changer le futur. Pourrais épouser une personne qui n'a pas la même religion que toi? Le dernier achat que tu as fait? Que collectionnes tu le plus? Des 4 éléments terre, eau, feu, air, lequel te représente le plus? Je dirais l'eau. Je pense que c'est le plus dangereux des 4 parce qu'il est sous-estime. En apparence calme, quand il est provoque (par le vent, ou le feu) il devient dangereux et je pense que je suis un peu comme ca. Je suis tres calme, j'accumule beaucoup mais il faut pas me chercher. Comme le dit bien l'expression, il faut se moquer de l'eau qui dors. En fait j'en ai deux. Le 1 et le 21. Mais si je dois en choisir un, je dirais 1. Je suis pas vraiment superstieuse mais il ya quand meme certains trucs auxquels je crois. Assez depensiere mais quand j'ai un objectif en tete je peux etre tres econome. Ton type de parfum: fruité, fleuri, boisé, musc ou naturel? Wow, it's soooo nice!! Love all the colors. Hi darling,I just found your blog,and I love it! I like the way you write your posts and choice of your photos.My old blog is was hacked,so I am following YOU now, because Im searching for new great blogs to follow. 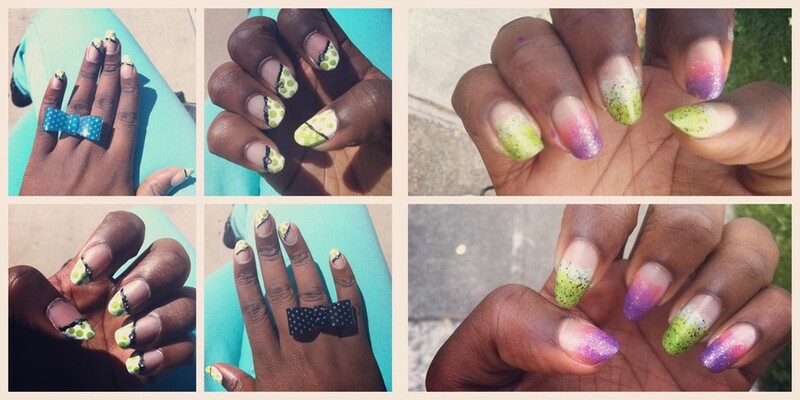 these are all such beautiful nail art!